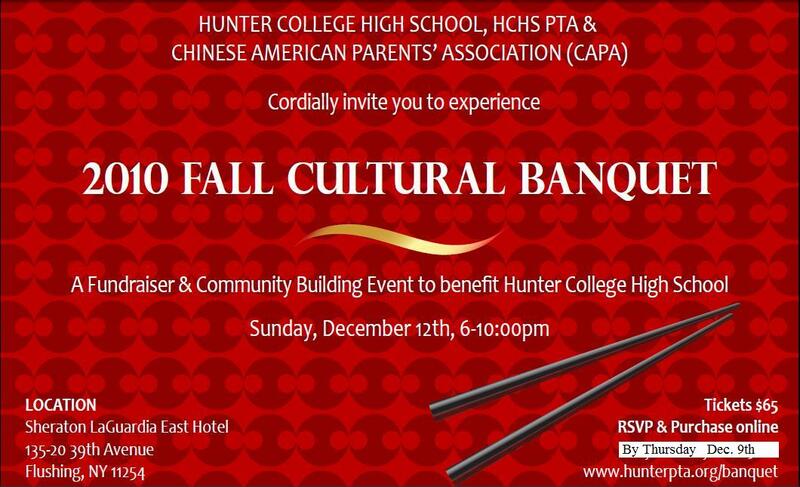 Hunter College High School, the PTA and the Chinese American Parents' Association (CAPA) cordially invite you to experience the 2010 Fall Cultural Banquet, a fundraiser and community building event to benefit Hunter College High School. The event will be held on Sunday December 12th, from 6pm to 10pm, at Sheraton LaGuardia East Hotel, 135-20 39th Ave, Flushing, NY. Tickets $65. RSVP and purchase online by Tuesday Nov 30th. We hope to see you there!